Ask fellow campers about "Texas Lakeside RV Resort" and nearby attractions. This is a very pristine park and they work hard to keep it that way. They have a nice pool with hot tub and the center focal point to this park is the catch and release lake. Nice walking path around the lake. The restrooms and showers are very nice and clean. If you were to be looking for a long-term Park in this area this is the place for you. I would say that 2/3+ of this park is long-term so it doesn't have that recreational/vacation feel to it. The park is very quiet as you would expect from a residential park. Lots of vehicle noise early in the mornings with people heading to work. If your looking for an outdoorsy, social recreational spot, this is not going to be what you are looking for. You don't see children out playing, people just sitting outside or smell those cookouts. There is really no socializing going on. They do police their rules which is good since it's a residential resort. Really a pretty place if your looking for a place to stay for a while. We camped at Texas Lakeside RV Resort in a Travel Trailer. Very nice high quality park with great facilities and sites, the cable had about 100 channels, the park is about 95% monthly or permanents. Only a handful of transient sites, we did not note a police presence as one reviewer posted or a noise problem Not a heck of a a lot to do in the city but it had all the basic fast food places and grocery stores and Walmart - we did some great birding south of town. Our site did not have a picnic table or patio but some sites had them We camped at Texas Lakeside RV Resort in a Motorhome. Stayed here one month in a 42 foot 5th wheel on a concrete pull thru site. Site was narrow and had no picnic table. Lots of workers in this park so be prepared for truck sounds at 6:30 am every morning. Cable TV provider is poor, wifi was good, fitness room was nice but small, library was mediocre, interior roads are good. No planned activities in park so you will be on your own. Not much to do in Port LaVaca and the town is sad. Cost included electric ($0.115/kwh) and a $25.00 site cleaning fee after we left. Having been all over the country in 70+ RV Resorts, never have we incurred this type of subjective charge. No reason to recommend Port LaVaca or this park as a result. We camped at Texas Lakeside RV Resort in a Fifth Wheel. The wind blows constantly in Port LaVaca. Not a lot to do in town, restaurants were disappointing and everything a long ways away. There is a winery in Lolito but it was disappointing. The town of Victoria, TX is larger and nicer and 27 miles away with more to do (kayaking, hiking and biking). Next time, we will stay there. Stayed in a 45 ft motorhome. Because of the way some toads were parked, had to put one wheel in the grass when leaving. Manager called two hours latter and said they added a $100 damage fee to my credit card. Pool and hot tub were closed. Plenty of good rv parks in the area, avoid this one. We camped at Texas Lakeside RV Resort in a Motorhome. My last choice in the Port Lavaca area. This is one of just a very few RV parks in Texas where the WIFI is SECURE and actually WORKS. By far the best RV park in Texas, and the best my wife and I have found in quite a while. We have stayed two times and will always stay here when visiting the Texas Gulf Coast. SUPER clean, orderly and the best staff ever. Love this place. We camped at Texas Lakeside RV Resort in a Travel Trailer. Texas Traditions Café & Bakery in downtown Port Lavaca is the place to eat. As noted the park has many long term residents. Many go to work early. They did not bother us, or put another way, we slept through any noise. We like that it is mid way to Houston from the RGV, the fact it is all paved, and easy in and out. We find all works well and is a good one nighter or more. We camped at Texas Lakeside RV Resort in a Motorhome. We stayed in Texas Lakeside RV Resort for three weeks in a fifth wheel and do not plan to return. The park is clean and well kept but it is also about 75% occupied by permanent residents and most are construction workers. The morning work caravan begins at about 5 a.m. and is mostly diesel trucks so there is lots of early morning noise. The construction workers drive like they are on a raceway even though there is a 7 mph speed limit. The neighbors surrounding the park have lots of dogs so they are constantly barking at dogs owned by park residents which is very noisy. The park is surrounded on two sides by two busy and noisy streets. To make matter worse their is an EMT dispatch location on one side of the park so there are many sirens all through the day and night. The persons who manage the park are not friendly and when we did go to the office to ask a question the person at the desk acted like we were bothering her computer activity and would not look at us. The WIFI system was only available for at most 2 hours per day so it is basically non existent even though they claim it is strong. When we ask the park manager about the problem she indicated it is a cable company issue. Charges for power are also a ripoff. We were told the electric rate but no one mentioned the $5.00 per month meter charge and if a stay spans two months there are two $5.00 charges. The clubhouse is nice but no one uses the facility because the park managers do not promote activities. Many of the spaces are very difficult to get in because they are straight in off of a narrow street. The website also says there are many things to do in Port Lavaca when in fact there is nothing to do. Port Lavaca is mostly a slum town with lots of crime. There are also very few restaurants. The laundry is nice and the rest rooms are clean but those amenities are overshadowed by the other bad issues with the park. Needless to say we will never be back. However if all you are looking for is a nice laundry and a clean restroom this park (or should I say trailer park) is for you. We camped at Texas Lakeside RV Resort in a Fifth Wheel. Rally rate, but regular rate is to high for location. Very friendly staff. Park is 2 years old. Lots of trailer, campers, 5 th wheels and full time worker residents. No tables. Strong Wi-Fi and cable. We backed up to the pond which was nice. We camped at Texas Lakeside RV Resort in a Motorhome. This area of the gulf coast is a fishing area, lots of construction workers and chemical plants...nice RV park.. This is a nice park, and would have given it a 10, except for lack of information when checking in. We were given our space number, and the lady at the desk pointed to the right with her finger. We were not given any park layout, and didn't know we needed a security number, to get back into the park after (we guess) around 5:00 PM. It was confusing as to what to do with trash. After driving 300 miles, it is so nice to get clear instructions at the registration desk. Even nicer, in a class A park like this one, is to use that Golf Cart we saw parked at the door, to guide you to your site. Places to eat are very limited. We highly recommend Main Street Grill. We camped at Texas Lakeside RV Resort in a Motorhome. It is new and easy to get to but for my 45 ft MH it was not level front to back..like many new parks they put too much slope to get the water to run off the pad. If I went fully level my tires in the front would be off the ground. Other than that a nice park. We camped at Texas Lakeside RV Resort in a Motorhome. This is a new park in Port Lavaca. The sites and streets are all concrete with very good spacing between sites. The park is very clean, quiet and the sites surround a very beautiful lake. This park is first class all the way. Only thing that would make it better would be if you could pull nose first, into the sites around the lake (of course only with a motorhome), so you had a view of the lake out your front windshield. We would definitely come back. We camped at Texas Lakeside RV Resort in a Motorhome. 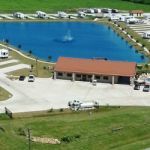 This is a brand new RV park with all sites situated around a small lake. The roads are paved and the sites are concrete pads surrounded by grass. Utility connections are excellent; Wi-Fi was lightening fast and there is a plethora of cable channels. The club room is enormous and is absolutely the nicest I have ever seen. The pool (unheated) and hot tub areas are very attractive. There is propane available, a nice laundry room too. The owner is pleasant and is working hard to make this park a great place. Downside would be that the trees and shrubs are in their infancy and it will take nature some time for things to grow. We camped at Texas Lakeside RV Resort in a Motorhome. Are you affiliated with Texas Lakeside RV Resort ?